What a fun CAS challenge this week. The challenge is to use scraps of ribbon. Okay…this is something that I have TONS of scraps and I hardly knew where to begin! I just LOVE the rainbow colors of the ribbon and it is perfect for the rainbow challenge on casology! Wanting to stay in the CAS style I decided to pick some of my matching chevron ribbon pieces and use them to make a nice little ribbon banner border. This card was so quick and easy to make! Yep that really is all there is to it! This entry was posted in Challenge, Clean and Simple (CAS) and tagged Hi There. Bookmark the permalink. What a fantastic combination of these challenges! I love the rainbow of ribbons sticking out! So glad you joined us at CASology this week, Mary! I love your card. The ribbons give it great dimension. 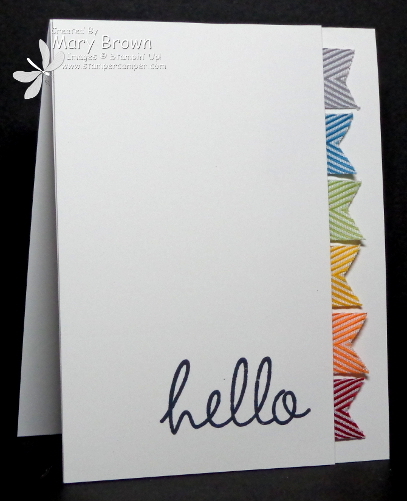 I love those little ribbon tags – they’re fabulous! Thanks for playing along with CASology this week!